Many of the people who are losing capacity have mild cognitive impairment or are in the early stage of dementia. While each person’s experience will be different, it will be a challenging and confronting time for most people. The person losing capacity may not be aware of this happening to them. They may be confused, resentful or angry about this being suggested. Alternatively, they could be aware of it happening and respond with a range of emotions – such as acceptance, depression, confusion, anger or grief. This will also be a difficult time for the person’s immediate family or friends. They may sense some changes in the person’s memory or functioning, but it may take some time before this is obvious and understood. There may be a long period where they know that “something’s not right” but they don’t know what it is, what to do about it or where to get help. This website focuses on planning ahead and does not attempt to address all the challenges faced by someone losing capacity. 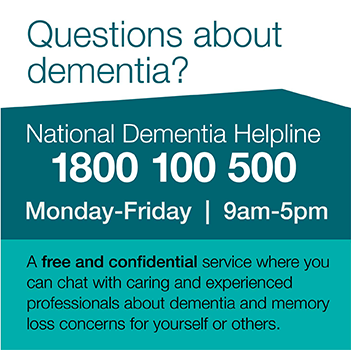 People who need more general information should contact the National Dementia Helpline on 1800 100 500. Helping my friend to complete the worksheets on this website is too overwhelming – we need something simpler to work on. My partner has been diagnosed with early dementia and he wants me to help him make some plans for his future. I really want to help but I am not sure what to do. My best friend has just been diagnosed with dementia at the age of 58 and she is absolutely devastated. She feels like her world has been turned upside down. What can she do? My dad wants to make an advance care plan but he just can’t make a start. I have just been diagnosed with dementia and I’ve heard there may be genetic tests my children can have to see whether they are going to get dementia. My auntie is thinking about making me her Power of Attorney but she is really worried about losing control over her affairs. My husband is having significant memory problems but he refuses to acknowledge there is anything wrong. He doesn’t want to talk about planning ahead. I suspect that my wife may have early dementia but our GP says she is just getting old and we shouldn’t worry too much. Bob and I have been living together as a gay couple for 18 years. He is starting to lose his memory and wants to put some plans in place for the future. One issue he is really worried about is whether other people will accept our relationship. My mum won’t talk about the future – she says it’s not part of our culture. Supporting Jim while he tries to make plans for himself has been quite stressful at times – I need to find some way to get support for myself.